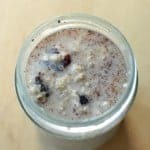 These cinnamon overnight oats are a staple of my autumn and winter mornings. Ready to go, they are perfect for slower mornings. It’s also entirely customisable to whatever your tastes. Try out other fruits, nuts and spices! Put the porridge oats, cinnamon and fruit into a regular sized jam jar (or any sealable container) and shake a little to ensure it’s all mixed up. Open the jar and pour in the milk and maple syrup, stir thoroughly to mix everything together (a chop stick works a treat), seal and place in the fridge. Leave in the fridge overnight and in the morning either eat cold or microwave for about a minute. Add any fresh fruit you’re putting on, grab a spoon and eat.